Awesome jacket... love the details and the color. What an extraordinary amount of work. I love the attention to detail, although I admit that I'm too lazy a sewer to attempt anything like this. Once again, I'm so impressed. Your coat looks great. Glad you have posted again. Have you tried using Scotchguard on your coat? I live in the land of heavy rain and it really seems to work. Love your coat. Very ambitious! I agree with Eileensews about the Scotchguard. Also, there are products called "Tech Wash" that let you launder in waterproofing. We use them to extend the life of ski clothes. Gorgeous jacket! 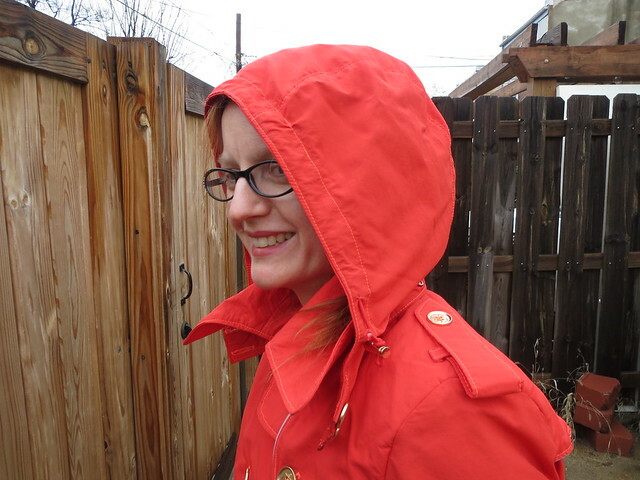 I have some of what I suspect is the same fabric from FabricMart, bought with the intention of making a lightweight anorak-style jacket for spring/fall weather in Seattle. For all of the "rainy" reputation we have here, our rain is mostly light showers, so I think I'll be fine, but THANK YOU for the heads up that I'll still want an umbrella in a downpour! 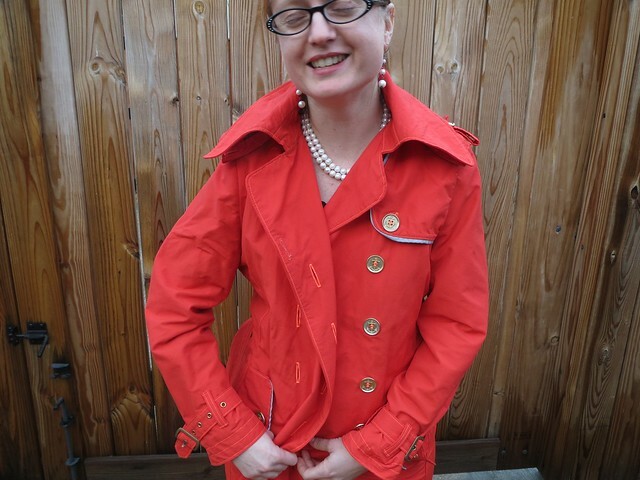 Otherwise, this jacket is gorgeous! Love the color and style. 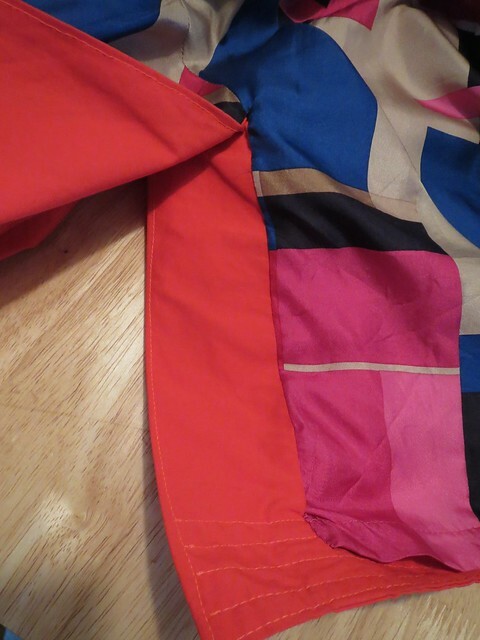 And THANK YOU SO MUCH for the video on lining a vent--I'm currently making a suit for my son and Burda's cryptic directions for a vent aren't cutting it. Wow, that was a decidedly non-slapdash project. I'm glad that the wear time justifies the construction time. The jacket is beautiful and you should be proud. 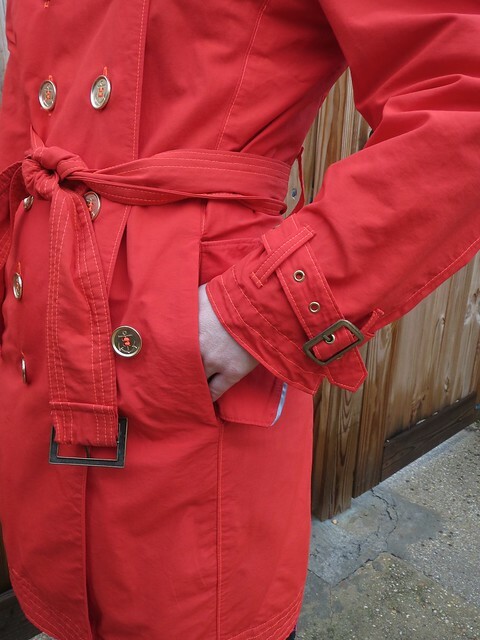 This is a very beautiful-and functional- trench coat! You have blown my (contained in an adult-sized head) mind. What the...? Such a big, impressive project, and a great result. One way to think about the water-resistant vs. waterproof thing: for those times you are not in a downpour, water-resistant is probably actually the more comfortable (breathable) option. And you bought a house? We want to hear more! Sorry that the fall had such sadness--hope things are brighter now. This is fantastic! 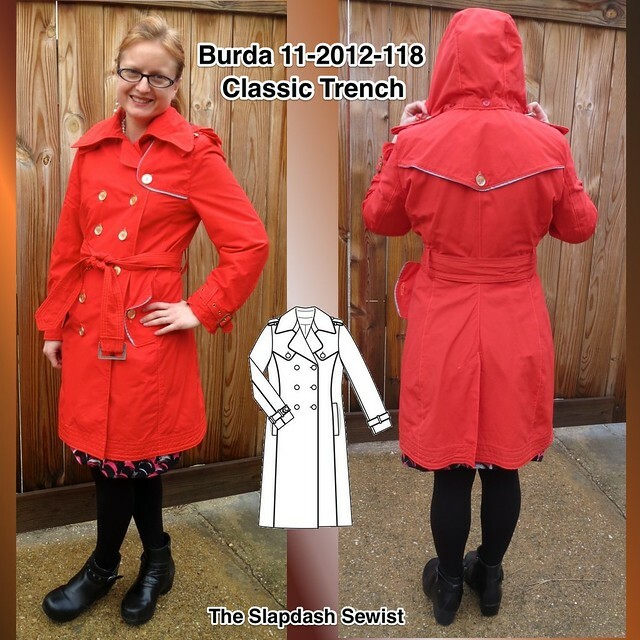 I've never seen a trench so I love your style of just going out and making it yourself! Great colour choice, really admire this. I hope you have treated yourself to rewards and pats on the back. This is a wonderful project. lovely for your climate and packable! You are a great inspiration to those of us who like functional clothing as well as beautiful clothing. Wonderful! The workmanship is fabulous. Great job! Glad to see you posting again! First congrats on the new house! I hope you have an amazing sewing room. Second it's good to see you back blogging. I've missed you and wondered if you'd just gone away. Third the coat is amazing! Hope we'll be seeing more new garments and that you're all settled in! I absolutely love it! This is the kind of project that is worth the attention to detail. Definitely a keeper for many years and the colour is great! Fabulous! Great coat. I love traveling with a thinner coat. Great news on buying a house too! I know it comes with three sewing rooms and enough storage space for your fabric buying spree in Italy. 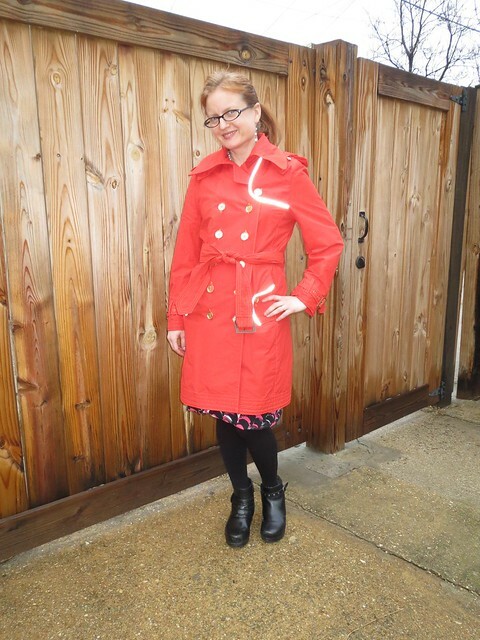 Great coat, love that you used red. Enjoy! 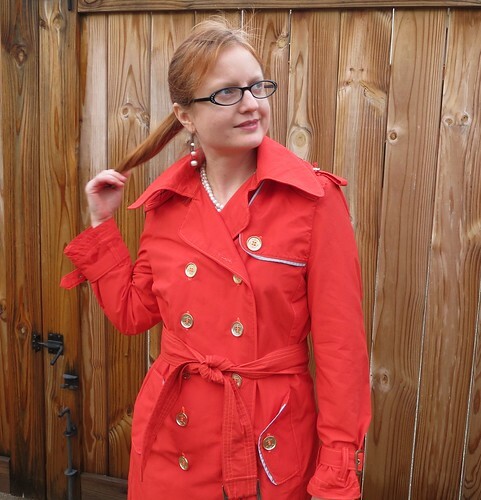 I too am normally a quick project sewist, but I bought a coat pattern specifically to go slow and meticulous. I imagine that my sewing process will end up like yours- good intentions... As long as it looks good and works, that's what's important- and yours looks great. I hope I have half the success! wow that looks splendid and I admire that you got it done under a bit of pressure. Really good job! And I love the pedestrian/bike safety features :-). 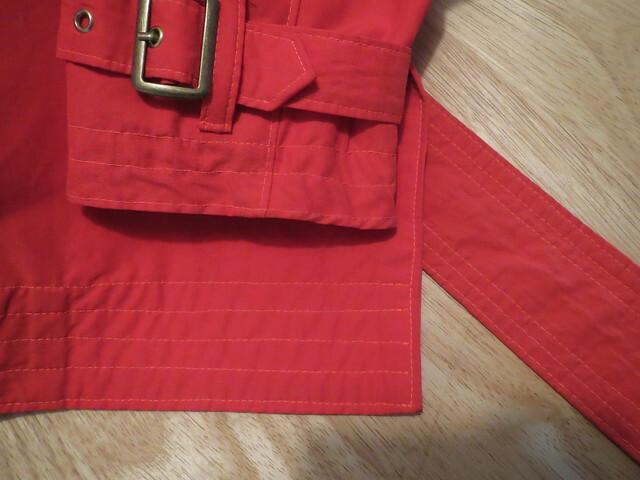 I've also found that angled pockets are a lot more functional than vertical ones, but you won't be making another for a good while :-). Don't fret too much about the water resistant vs proof. Soft shell fabrics were developed after years of everyone struggling with their waterproofs, including their goretex which was never -that- breatheable. All told, if you're going to be moving at all in your weather layer, you won't be too cold if you're a bit damp. And much rather be a little rained on than bathed in sweat. Weather resistant covers 95% of real-life conditions, weather proof is much more specialized. You can always supplement with an umbrella (or a trash bag, depending on the circumstances) if you get caught in a downpour. Wow this looks amazing, it was obviously a huge amount of work with all those details, but well worth it. Wow. Beautiful. Every time I get down on how long it takes to make a jacket, I remember how great they look in the end and how long they last in your wardrobe. So worth it! I was wondering where the detachable hood connects--is it under the collar in the neck seam? 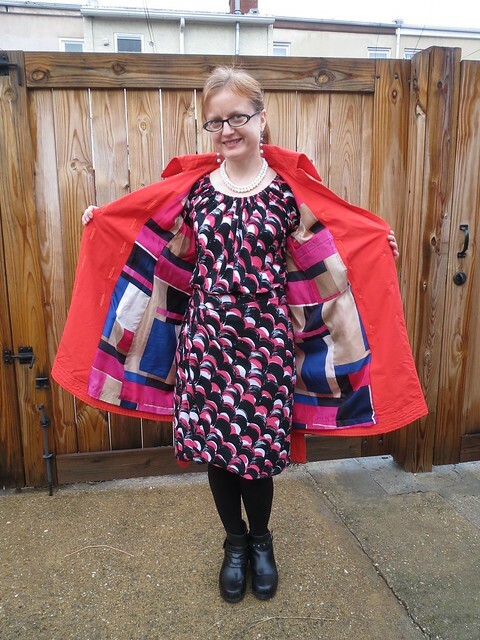 I bought this fabric as well and made up a spring coat. It definitely can only support a drizzle. I just use that as an excuse to stay indoors in inclement weather! Fantastic coat. Miss your regular posts. Stop living life and sew. Worth all the work - it looks great! Looks lovely. Never woulda thought of that color, but it's perfect! Hope you are ok Treena. Merry Christmas. I've missed your reviews, hope all is Ok with you.